Čezeta scooters were first launched in 1957, and their futuristic looks made them a huge success worldwide in the early 60s. They featured widely in films of the time, and have continued to be seen throughout eastern Europe, where they are arguably far more popular than other classic scooters such as Vespas. In Western Europe, these scooters are rarely seen, and for this reason, if you have one you can be sure you’ll attract a lot of attention! 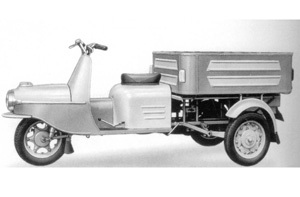 The original manufacturer of the Čezeta scooter was the Česká Zbrojovka Strakonice (ČZ) company, once part of the world’s largest manufacturer of two-stroke motorcycles. From 1957 until 1963, approximately 115,000 scooters were produced (in two types, 501 and 502) and sold throughout the world. The 502 is a two-seater scooter, using a light and strong monocoque construction, and powered by a 175cc, two-stroke air-cooled petrol engine. The model came in two types: 502/00 has a dynastarter added, 502/01 is kick-started. The clutch runs in an oil bath, controlled by a lever on the left side of the handlebars. There are four gears, controlled by a two-way foot lever on the left side. Operation of the clutch during higher gear change is automatic. Neutral gear is indicated by a light on the instrument panel. The rear wheel is chain-driven. The carburetor make is “Jikov”, the spark plug is solex. The scooter uses drum brakes. The rear brake is controlled by a foot lever on the right. The front brake is controlled by the right lever on the handlebars, and is adjustable without tools. The bodywork is monocoque without a chassis and the petrol tank holds 12 litres of fuel. On top of the petrol tank is a rack for carrying up to max 15kg. Underneath the seat is a lockable cabinet for tools etc and space for the battery. The seat opens forward to lie on the handlebars which have a diameter of 22mm and length of 685mm. The front suspension has two oil-filled shock absorbers and rubber blocks to limit their movement to 100mm. Each shock absorber contains approx 50cm3 of oil. The rear suspension similarly uses two oil-filled shock absorbers, attached at their top end to the bodywork. A steering lock is located behind the panel in front of the rider. The speedometer is on the left of the control panel, and the key ignition on the right. Also on the panel are control lights: orange indicates neutral gear; red shows the battery rather than dynamo is being used. The ignition is by 12V/90W dynastarter, attached to the motor compartment and accessible through the right ventilator. Various components like a condenser, terminal block and main electric shutoff switch were connected to it. A regulator relay is in the storage space. Two accumlators of 6V/12Ah are stored below the seat, connected to one another in series. Ignition of the starter motor is unmarked to the left of ‘0’. Ignition from the 6V/45W 14Ah battery. A ‘stop’ switch is attached on the right side panel. The handlebars are enclosed by panels. A larger illuminated oval speedometer is in the middle of the handlebars. Two control lights are located directly on the speedometer, performing the same functions as on other models. This model had the same 12V electrics as the 502/00. The handlebars are enclosed by panels. A larger illuminated oval speedometer is in the middle of the handlebars. Two control lights are located directly on the speedometer, performing the same functions as on other models. This model had the same 6V electrics as the 502/01. The 501 was a two-seater scooter, using a light and strong monocoque construction, and powered by a 175cc, two-stroke air-cooled petrol engine. The engine is kick-started. The clutch runs in an oil bath, controlled by a lever on the left side of the handlebars. There are four gears, controlled by a two-way foot lever on the left side. Operation of the clutch during higher gear change is automatic. The rear wheel is chain-driven. The carburetor make is “Jikov”, the spark plug is solex. The rear brake is controlled by a foot lever on the right. The front brake is controlled by the right lever on the handlebars, and is adjustable without tools. The petrol tank holds 12 litres. On top of the petrol tank is a rack for carrying up to max 15kg. Underneath the seat is a lockable cabinet for tools etc and space for the battery. The seat opens forward to lie on the handlebars. A steering lock is located behind the panel in front of the rider. The handlebars have a diameter of 22mm and length of 660mm. The front suspension has two oil-filled shock absorbers and rubber blocks to limit their movement to 100mm. Each shock absorber contains approx 50cm3 of oil. The rear suspension is spring-loaded, again with rubber blocks to limit travel to 95mm. The speedometer is on the left of the control panel, and a clock is on the right. Also on the panel are control lights: orange indicates neutral gear; red shows the battery rather than dynamo is being used. Power to the spark plugs is supplied by a DC 6-volt 45-watt dynamo. A regulator controls the switching of the current from the battery to the dynamo. Extra current generated by the dynamo, charges the battery. The battery is 14Ah, 6V, standard lead-acid. A 15A fuse (standard CSN 72581) is located behind a panel in front of the rider. The headlight has a 6V bulb and 25 watts, the brake light 6V and 10 watts, indicators are 6V and 1.5 watts. 501 – Series production from 1957. 501/01 – From January 1959, 2,000 produced. Updated carburetor and spark plugs in the motor. Lengthened handlebars to 685mm. A model 501/02 was produced with differences to the electronic systems. 501/03 From March 1959, 16,000 produced and fitted with new axial ventilator. A model 501/04 was also produced, again with a different alternator. 501/05 From approximately October 1959, 25,000 produced Model is fitted with a 12V-90W ‘dynamo motor’ – a starter motor and dynamo in one. Design 501 – serial production in 1957. The performance model has a year earlier. Version 501.01 – from (ca. January) 1959 – 2000ks produced without the fan. 501.02 Implementation of the tropics distinguished tříokruhovým alternating ignition, at which it is used as a source magnet alternator with rectifier 6V/15A with different switching cabinet. 501.03 Execution – March 1959 – 16000ks made with a fan. 501.04 Implementation of the tropics distinguished tříokruhovým alternating ignition, at which it is used as a source magnet alternator with rectifier 6V/15A with different switching cabinet. Version 501.05 – from Q4 1959 – 25000ks made with fan and dynastarters 12V. Dynamo-90W-12V starter, axial cooling fan. Finally, performance you expect from a conventional scooter without the expense, noise or pollution. Čezeta provides you with a 100% electric scooter that combines advanced technology with the classic style and quality construction of the 502. Scooterists generally want their machines to be easy to operate and that’s what the Čezeta is – it has no clutch or gears; just get on, twist the throttle, and go. 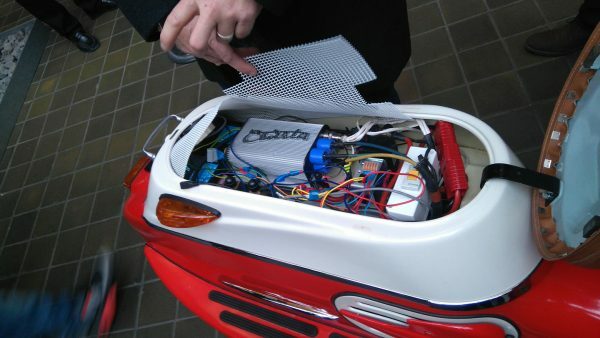 Our proprietary software optimises the performance of the scooter by managing the battery capacity and motor output power. Supported by its advanced electronic systems, an electric Čezeta is practically maintenance free, and comes with a one-year warranty. The scooter is restored from a genuine original bike, but the brakes, tyres, and other equipment that affect safety are new. All the practical features required for electric use are included, such as an internal charger and a 3-metre charging cord to charge the scooter in any convenient electrical outlet.